More than a Walk in the Park! | A Sharmed Life! More than a Walk in the Park! I walked more miles (kilometers), covering more ground in Central Park in the last 10 days than the entire last year. I’d say easily, but my tired legs at the end of the day told me that my walk-til-you drop NY leg muscles were not what they were before I went on summer holidays. Central Park is one of my favorite places in all of New York City. You can feel its elegance and playfulness as the sun rises first thing in the morning, shines brightly in the middle of the day, and glows magnificently with city lights as dusk turns to darkness. No two visits feel the same. Last week, Kevin and I met his friends at the boathouse. Anywhere near the boathouse, you can’t help but watch the people rowing the boats in the pond, somehow the ones who seem not to have ever rowed a boat before based on their attempts to coordinate the oars. On the way to a must stop a the carousel, we came across the bubble man. 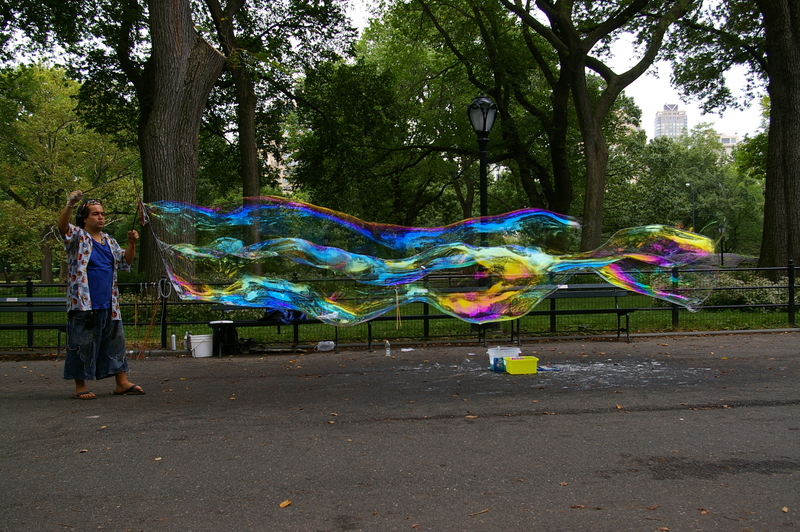 With some sticks, string and a bottle of dish soap, the bubble man quietly entertains those who care to linger with bubbles of all shapes and sizes, colors and hues. Off to the carousel to experience that iconic twirl on the merry-go-round, as the kids scheme to pick the perfect painted horse, wait for that special music to begin and hope that this up and down around and around is the longest one of the day. Our ride always seems longer than the last one, part of the magic I think of being the lucky ones to ride with Kevin and his friends. Our path takes us to an obligatory stop at one of many playgrounds in the park, where we were welcomed with the loudest buzz of children swinging and sliding and not wanting to leave. We stopped at the big swings, which led to a long swing for Kevin and his friends and even a quick swing for the moms, symbolic of our own youthful park days. My adult-only days in the park that followed the next week were completely different adventures. They merit their own tribute another day. For now, I smile as I think of some of my own memories of the days as a kid in the park and at having created some new ones at the grand-daddy park of them all — Central Park. It’s a Sharmed Life!